I’ve been mildly surprised that a number of new Solaris owners do not have a Compact Flash (CF) card reader for use with their computer! You will need one to make backups of your Solaris CF card data, plus it’s the only way to read the User’s Guide/Getting Started and Welcome READMEs I’ve put there. The card reader is a USB connected device, and most of them now are multi-format readers. (All you need is the CF slot, however.) Plug in the reader to any available USB slot on your computer, then insert the Solaris CF card and open it to get access to everything! John Bowen wrote: I’ve been mildly surprised that a number of new Solaris owners do not have a Compact Flash (CF) card reader for use with their computer! All my PCs have them, and for the Mac Tower I got a little external USB powered hub which includes multi-card reader in one. Very cool. I have so much MIDI gear it would warp your soul. I am the CEO of Neotrope® and am also the editor at MusicIndustryNewswire.com and have been a music journalist and MIDI guru since 1984 (ie since MIDI existed). Most card readers don't have CF slots, so unless you have a camera that uses CF cards you may not have a reader for it. Every device I've ever had uses SD cards (until now, that is). It's only $8 (US dollars) and it works great. I didn't even power on my Solaris until I picked up the card reader. Didn't want to chance messing up anything on the card, so I backed it up before I did anything. Hard to go wrong for eight bucks. My dream laptop has the 34/4 Express slot for the XITE-1, x79 w/ the 3820k CPU, 32GB SoDIMM RAM, 2 x SSD's and a DF Crad reader built in for Solaris. Overkill unless your'e gigging, but heaven on Earth for me as the racks are history now. 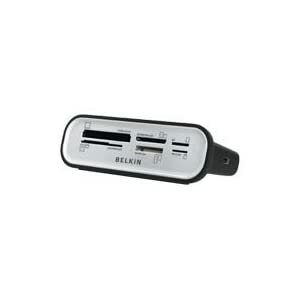 I've been using this Belkin card reader for a while now. It reads just about everything without any fuss. Besides the Solaris, I also use it to read my son's PSP memory stick, various camera cards such as xD, CF, SD and MMC. It even copes with the newer Mini and Micro formatm such as those used with mobile phones. Currently on Amazon for around $22. Probably a stupid question - but i've ordered one of those "all in one" reader that's supposed to be compatible also for cf card. I got it - but the solaris's card doesn't fit any of the slots. Are there more than one size for a cf card? If so - what should i look for when i look in the reader's specs? Highly unlikely that it doesn't fit! I'd be surprised...what brand or model did you order? I've never seen any incompatible CF reader!